Citrix XenDesktop 7 is the successor for Citrix of the XenApp and XenDesktop, it delivers a workspace in many form to users connected either connected through a LAN or a WAN. In this blog I will show you what has changed in the manageability with XenDesktop Director. 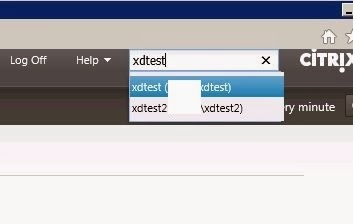 The main focus of this blog article is to show you how shadowing works in XenDesktop 7.. shadowing 2.0 or 3.0. In my previous blog article I guided you through the basics of XenDesktop 7 App edition, this blog is a follow-up on that. If you haven’t read the first part, here’s the link Part1. For you not familiar with Citrix XenDesktop 7 let’s do a quick introduction. Citrix now offers three consoles to manage your environment (when you don’t use Provisioning server). Citrix Studio, which is the site configuration console. 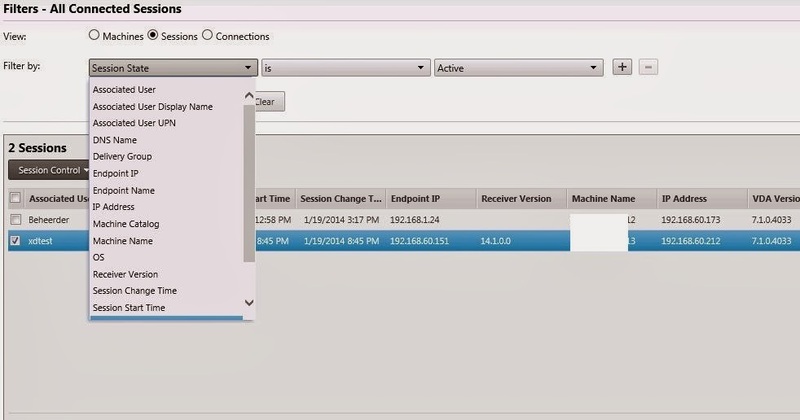 Citrix Scout, not really a console but offered to do sanity checks on your environment. We talked about Studio in the previous blog.. sure you read it by now :), we’ll talk about scout in an upcoming blog (I like Scout a lot). Today we’ll look into Director, the helpdesk tool. Director is installed on the Controller server and is reachable via an URL, https://<controllerFQDN>/Director. At that point you are prompted to logon, to logon you need to have a certain rol assigned to your user, either helpdesk administrator, full administrator or one of the other roles you can set in Studio. 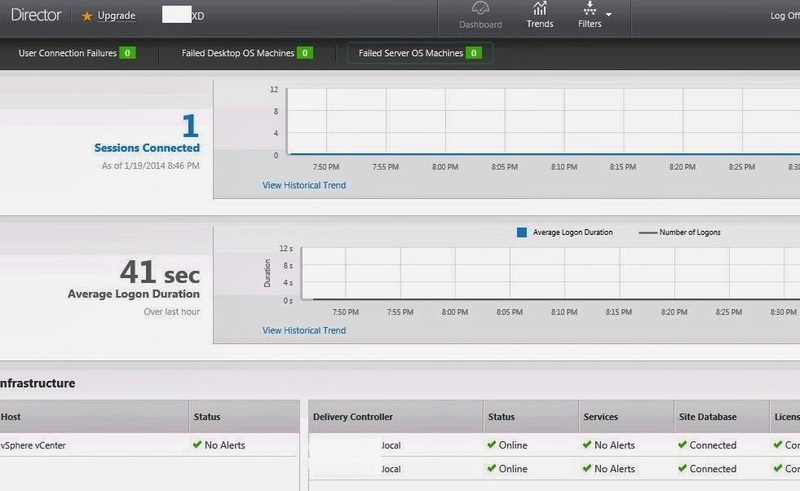 The first screen you will encounter is an overview in which you will see details of the number of connections and average logon times. I guess it’s a neat screen for an overview. 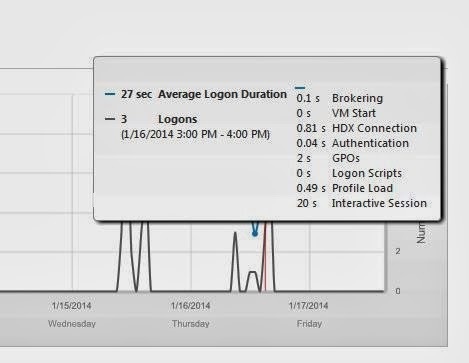 I like the Average logon duration screen, that was I think the most wanted report from Edgesight. if you move the mouse of a certain point in time you will get a nice pop-up showing the break down of the logon duration, pretty neat. At the lower part of the screen you will see the overview of the infrastructure and it’s health. It’s a quick view to see if all components are up and running. It shows the database, service and license server status. I was looking in the console for a way to shadow a user session but couldn’t find the option anywhere. There a not that much places to look in the console so at first I thought either I didn’t install it or my rights are not configured correctly. After numerous checking I knew it had to be there, it just was hidden. From the overview screen you can click on the session number that is shown, from there you are taken into a more detailed session overview. Surely there you would expect the shadow option. You can filter for session and under session control you can logoff a session or send a message… there is no shadow option. If you take a quick look back at the screen you’ll see that there are no more menu’s to click. At last I entered the name of the user in the search bar.. something you’d never do with only a handful of users connected. It finds the user, it finds all users ever connected and you are taken to a hidden page. At this page all of a sudden you can shadow the user, I’m still wondering why there is no direct link on the homepage to go to this page. 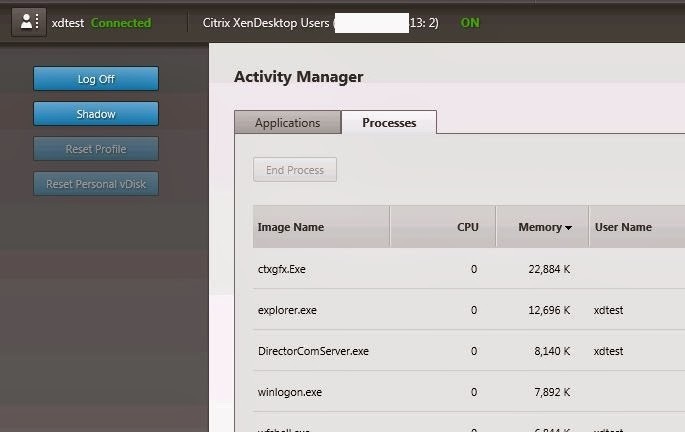 Isn’t shadowing one of the core functions of a Citrix XenApp environment? Anyway from this page we can see the applications the user has running, I had none and was logged on via a published desktop. The processes I was running are shown under the tab processes. When I click Shadow (of course I initiated a session on another machine first). it starts up. While the request is being set the shadowing screen is opened. In my XenApp desktop I get a question to repsond like you would expect, the system is asking me if I want to have shadowed connection. 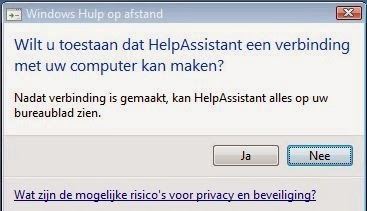 It’s in Dutch I now realize but hey surely you all know your Dutch… It’s asking if you want to allow a help assistant connection with your computer. Ja means Yes in Dutch and Nee means No so let’s click on Ja. Once you cliked Yes or Ja you will see the remote assistance bar floating in your session, you can stop the shadowing or chat with the service desk guy helping you. On the other side the guy at the service desk will see you screen but can’t control it yet, to control it he or she has to ask permission. the REquest control button will do the trick. 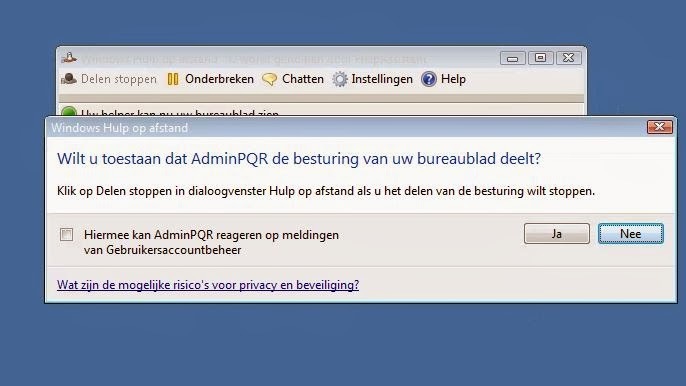 Again a pop-up appears on your screen asking you if you allow him or her to take control. It works fast with no errors and seems to be user friendly. only things is they hidden it. It’s a quick look into manageability of XenDesktop 7 and the possibility to offer remote assistance. the old shadow function is gone, remote assistance is the way to go. It’s to far hidden in the console, the console should have a user details page offering from the main page for that will be the core function for a service desk imho. I really do like the average logon duration they show on the page, it shows a good amount of detail without having to buy those expensive licenses like you had to before. Hope you enjoyed reading about it and please add comments if you disagree about something or found a neat feature I didn’t write about.